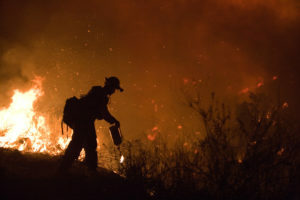 In January, Pacific Gas and Electric (PG&E), California’s largest utility, declared and subsequently filed for bankruptcy as a result of incurring as much as $30 billion in potential liabilities from transmission-caused wildfires in 2017 and 2018. The utility faces over 1,000 lawsuits and may be unable to completely handle its liabilities, possibly requiring significant state intervention. This raises critical questions about utility operations and business, and what policies are necessary to assess liability in an era of growing climate risks. Liability for each fire is determined by California’s Department of Forestry and Fire Prevention on a case-by-case basis. Under California’s strict liability doctrine, even if PG&E is in full compliance with regulations, it still remains responsible for all damages caused by fires ignited by its equipment, which may have been the case with the Camp Fire in 2018. PG&E could be exposed to additional liability if it failed to take sufficient corrective actions after being found responsible for other small fires in 2017. PG&E continues to have electric service obligations in areas with severe fire risks. Accordingly, a federal judge has ordered PG&E to take immediate actions to address fire risk, actions that could cost as much as $150 billion this year—quintupling rates. While PG&E is unlikely to go under, the size of PG&E’s bankruptcy is one of the largest in energy and utility history and has significant ramifications for an industry in transition. As utilities begin to struggle with the realities of climate change, better policies are needed to protect customers and help the utility industry manage risks. PG&E’s bankruptcy presents serious challenges to California’s decarbonization goals and has wider implications for the entire energy industry in an era of increasing climate risk. PG&E has signed more power purchase agreements from renewable energy than any other utility in the country, agreements which could now be renegotiated as a result of federal bankruptcy proceedings. Rate increases that may result from determinations of liability and equipment upgrades may significantly reduce the country’s ability to decarbonize. PG&E and other utilities must address liabilities from extreme weather events and other risks in order to meet climate goals and protect customers from the financial burden of an outdated system facing a changing climate. 1) What state or federal policies are needed to address utility liability from wildfires, extreme weather events, and other reliability risks? 2) How will PG&E’s bankruptcy impact California’s clean energy policies and goals? PG&E is one of the largest climate change-induced bankruptcies so far, although there have been many thousands of smaller such bankruptcies (e.g., from Katrina, Sandy, etc.). And there will be many to come. According to a paper in Science, wildfires in the western United States have been increasing in frequency and duration since the mid-1980s. Between 1986 and 2003, wildfires occurred nearly four times as often, burned more than six times the land area, and lasted almost five times as long when compared to the period between 1970 and 1986. Given that the conditions that make these fires more likely are primarily driven by the use of fossil fuels, perhaps the government should have fossil fuel companies pay a share of the damages from such fires. There are already several lawsuits underway that are trying to assign damages to fossil fuel companies. None have succeeded yet (as far as I know), but like tobacco, eventually some will succeed and that will greatly impact the industry. 1) State and federal policy must be developed that prioritizes distributed energy resources (DERs) in extreme fire hazard areas. Continued reliance on high-voltage transmission in these areas cannot continue, especially in drought-stricken California, and funds previously allocated to transmission infrastructure should be rededicated to developing, managing and maintaining community and regional microgrid energy systems. 2) PG&E’s bankruptcy cannot be allowed to negatively impact California’s California’s clean energy goals. Renewable contracts should be honored as a necessary public investment in a renewable future. If PG&E cannot survive in its present form, then it should be broken into manageable pieces and the state must become the “provider of last resort.” See https://www.latimes.com/business/la-fi-monopoly-utilities-california-20190207-story.html. I wonder if there are some lawyers or legal scholars reading this thread who can answer a question. Does California law treat fire liability for utilities under a strict liability standard, or is it necessary to show negligence in order to establish liability? Negligence would seem the more reasonable standard to me, and I do not deny that PGE may be shown to have been negligent, e.g., inadequate trimming of trees, insufficiently frequent inspections, and so on. A PGEs obligation to provide service to risky areas under public utility law is a complicating factor. It seems paradoxical to hold them liable when it is entirely conceivable that some communities cannot be served at all in a way that reduces risk to a level that would pass the Hand test for negligence, at least in its marginal formulation. That interpretation of the Hand rule says that a defendant is if the marginal cost of the precaution against damage is less than the marginal decrease in damage. In serving remote, wooded communities, it could be that the only way to meet the Hand rule would be not to offer service. All the more so under strict liability. Notably, the story says that PG&E considered this strict liability as part of its decision to declare bankruptcy. Without it, PG&E’s potential liability is much lower and would require case-by-case analyses of PG&E’s potential negligence (as opposed to just whether PG&E equipment started the fire). This was a notable issue during legislative debates last summer related to the 2017 fires. A legislative solution may be required but is more likely to be changed prospectively than retroactively. We are going to have this conversation but we are not ready for it. Begin with fire. California and the rest of the West have been managed for a century under a myth — that fire is the enemy, and should be uniformly suppressed. We now know that it is excess fuel accumulation that is the enemy, and that climate change has dramatically empowered that enemy with a longer, hotter dry season. The specific liability challenge facing PG&E would seem to have a logical solution. PG&E shareholders should be liable for PG&E negligence. But providing electricity using overhead wires is now known to be an intrinsically dangerous activity, and ought to bear its fair share of fire costs — but those expenses should go into the rate base, they are an unavoidable cost of an overhead electrical grid. In some cases undergrounding may be the most cost effective solution — in others greater reliance on distributed renewables and storage are clearly urgently needed. And the area to be cleared may need to be much larger than current regulations provide — Judge Alsup clearly thinks so. This doesn’t seem impossible to sort out, although both legislative and regulatory fixes would be needed. But we have merely dodged one land mine, two hidden ones remain. The costs of providing power to low density rural communities and residents have always enjoyed some level of cross-subsidy in the name of universal electrification. It just costs more per kwh to run wires through the urban wildland interface than down my street in San Francisco. Now the costs of more aggressive tree and brush clearing and paying for fires that occur anyway from line failures threaten to make that cross subsidy enormous — perhaps higher than the political consensus for universal electrification will sustain. And what if the cause of a particular fire is actually irrelevant, because fuel overloading means that a particular neighborhood was going to burn down anyway, sometime in the next decade or two — whether from a power line, an overheaded lawnmower, kids with fireworks, careless campers, or even lightning. If, as the experts tell us, huge swathes of California forest, grass, brush and chapparal that have not burned in the last fifty years are going to inevitably burn, does it make sense to pick one activity that could be the proximate cause of such a fire and require it to pay for making a given watershed fire resistant? And part of the solution is replacing invasive annual European grasses by restoring native California bunch-grasses. Who pays for that? PG&E? Or should we, instead, start with the real enemy — excess fuel load, not fire — and systematically derisk the areas of the state we have allowed to become exurbanized? We could have utility companies paying for risks proximate to their lines, insurance companies kicking in to reduce their loss exposure, rural homeowners paying a fire protection fee, and the state’s climate cap and trade revenues picking up the rest — in exchange for an agreement that the derisking would be done in a way which would maximize the increase in carbon stored in areas made more fire resilient, in part by converting cleared fuel into biochar? My comments here are inadequately thought out — but they are dramatically more expansive than most of the current conversation — this is big, at least as big as the Dust Bowl. Will we wait until the depopulation of much of rural California to start thinking about the true scale?